Special thanks to Paraguayan filmmaker Rodrigo Alvrenga and Peace Corp volunteer Liz Wolfe who worked extensively with Roque, Belen, and their families to create the following video. Belen and Roque both grew up in Tobati, Paraguay and graduated from Team Tobati's Macchi School. Despite significant economic and environmental challenges both have excelled in and out of the classroom and have defied incredible odds and have been accepted to U.S. universities receiving substantial scholarships. Studying in the U.S.A. has been their ultimate dream since they were young children. Team Tobati is raising money to cover the small part of their tuition not covered by the university as well as their transportation costs. They are so close to reaching their dream. We are asking for a little help for this final step. Please read brief summaries written by Belen and Roque below. My name is Belén Rodriguez. I’m 19 years old and I’m from Tobati, Cordillera, Paraguay. Today, I live with my father, step-mother, grandmother and three younger siblings. When I was 9, my mother moved to Spain to find work, and I was faced with the challenges of growing up in a single-parent household, where I was often struggling to make ends meet and had many responsibilities at home. Due to my hard work and curiosity as a dedicated student and young community leader, I earned a full scholarship in 2009 through the NGO Team Tobati to attend the Macchi School (Instituto Cultural Reinaldo Macchi), the most prestigious schools in my city. At the Macchi School, I excelled in all subjects of the rigorous academic curriculum, taking a special interest in learning English and graduating amongst the top of my class in 2014. After my first year studying at the Institute in 2010, I was offered a scholarship by the United States Embassy to study English at the Centro Cultural Paraguayo Americano, where I continued to improve my English abilities and learn more about the importance of studying internationally. In 2014, I won another scholarship from the US Embassy, called the Youth Ambassadors program - which provided me the chance to travel to the United States to stay with host families and work with community leaders to develop projects that would benefit my community back home. Through my academic achievements and my perseverance after graduating, I was offered a place in the Opportunity Funds Program and received the support to start and finish the process of applications to universities in the United States. This year I was accepted to Berea College in Kentucky. I received a 98% tuition remission offer from Berea College, and only need to cover the remaining 2% in order to confirm my spot to start classes in the fall of 2016. ​Due to my involvement in the field of NGO’s, cultural exchange and community development, I plan to study International Politics and Policy. 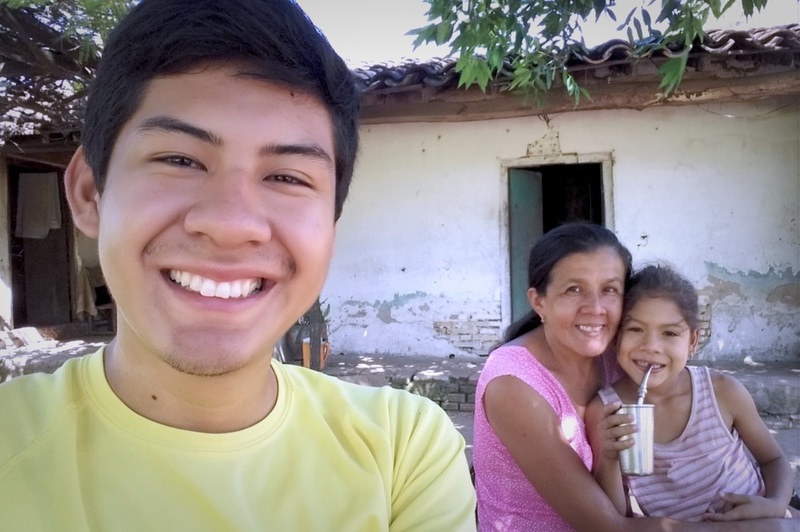 I believe that studying in the United States will provide me the unique opportunity to gain a deeper understanding of the world and its issues, share my culture and knowledge as a young Paraguayan leader, and to continue on my dedicated path of giving back to my family and community at home in Tobati. Any amount of help that you can offer would be appreciated in unimaginable ways. I extend an enormous hug of gratitude in advance. In my native Guarani language, “Aguije che angirǔkuera!” (“Thank you my friends”!). My name is Roque Ariel Otazo. I am 19 years old. I come from a poor family from the countryside of Tobati, Paraguay. During my childhood I had the big and crazy dream of studying abroad in the United States. In the 7th grade, I obtained a full scholarship to study at the at a trilingual school named the Macchi School in Tobati. Since that moment I started learning English and I was obsessed with the idea of taking the first important steps towards my goal. After graduating at the top of my high school class at the Macchi School, I was able to apply and obtain additional scholarships that helped me towards my ultimate dream. For example, I was awarded the English Microsholarship from the Embassy of the United States of America in Paraguay, and some years later entrance into a competitive program called "Youth Ambassadors" (2014), which gave me the fantastic opportunity of visiting the United States for three weeks. I have recently finished the process of applying to universities in the USA and am very proud to say that I was accepted with a 95% scholarship to pursue my college studies at Saint Anselm College, located in Manchester, NH. ​Thanks to Team Tobati, Amigos de las Americas, and Education USA, through its Opportunity Funds Program, my life long dream is now on verge of coming true!